A native of Bolton, Mississippi, Congressman Thompson began his political career over 34 years ago when he won his first elected office as Alderman in his hometown of Bolton. After four years as Alderman, he served six years as Mayor of Bolton and then was elected Supervisor of Hinds County District Two. He served as County Supervisor for 13 years. He was elected to the U.S. House of Representatives in a special election in April, 1993, and represents Mississippi's Second Congressional District. He currently serves on the House Committee on Agriculture and the House Select Committee on Homeland Security. Bennie Thompson was educated in the public schools of Hinds County, Mississippi. He received a Bachelor of Arts degree in Political Science from Tougaloo College, and a Masters of Science degree from Jackson State University and completed extensive coursework at the University of Southern Mississippi toward a doctorate degree in Public Administration. For a brief time in his professional career he taught in the public school system of Mississippi and also served as an adjunct professor at Jackson State University. A lifelong activist in the civil rights struggle, Congressman Thompson has been a participant in the complete spectrum of the fight for equality and in making the political system work for every citizen. 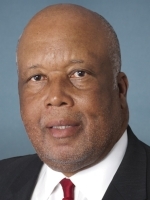 As a grassroots volunteer, labor organizer, student activist, community leader and politician, Congressman Thompson remained focused in combating and working to address issues of race, gender, and class in both the private and public sectors. Being a product of Mississippi colleges he had first hand knowledge of the disparity between funding, equipment, and supplies provided to the historically black colleges and those provided to white colleges. In reaction to that situation in 1975, Bennie Thompson became one of the original plaintiffs in the Ayers Case, which was decided in favor of the plaintiffs by the United States Supreme Court in 1992. Securing the first rural doctor, fire engine and trained volunteer fire department of the town of Bolton. Being a plaintiff/material witness in numerous election redistricting cases-a constant warrior in the struggle for fair election districts and rules in state, county, and city elections. Taking the position of front-line supporter of worker's rights, on the picket lines and in the courts. Receiving a Presidential appointment to serve on the National Council on Health Planning and Development. Securing federal funding to set up and operate the first public transportation system to serve rural Hinds County, Mississippi. Being a Founding Member and past President of both the Mississippi Association of Black Mayors, and the Mississippi Association of Black Supervisors. Congressman Thompson has been the recipient of several honors for his legislative accomplishments. He received an award from the Housing Assistance Council for his efforts to secure sufficient funding for rural housing programs within the U.S. Department of Agriculture. The National Black Nurses Foundation honored him for his support of quality and affordable health care for all Americans. Congressman Thompson, a lifelong member of the Ashbury United Methodist Church, located in Bolton, Mississippi, has been active in numerous civic, community, and professional organizations. Claflin College in Orangeburg, South Carolina, recently conferred the honorary Doctor of Laws degree on Congressman Thompson, noting that it was given for a "life dedicated to the civil rights movement". The Congressman is a member of the Board of Trustees of Tougaloo College, the Board of Directors of the Southern Regional Council, and the Board of Directors of the Housing Assistance Council. In his participation on each of these Boards, as in his day-to-day activities, he has steadfastly adhered to the principles of parity, entitlement, and the assurance of the protection of the rights of minorities. He is married to the former London Johnson of Mound Bayou, Mississippi, and they have one daughter, BendaLonne. 03/10/2020 MS District 02 - D Primary ?? ?